Considered the “Jewel of Jamaica”, Couples Sans Souci offers guests natural beauty, island atmosphere and romance. Located in Ocho Rios Jamaica on Jamaica’s sunny northern Caribbean coast. With 150 suites having ocean views, Couples Sans Souci is a lush tropical paradise. Suites have French or sliding doors leading to private, furnished balconies or patios., and decorated in shades of royal blue and cream and accented by island artwork and accessories, these luxurious air-conditioned accommodations have king beds, ceiling fans, iPod docking stations and mini-bars. All rooms and suites have plush terry robes, Gilchrist & Soames bath amenities, hair dryers, showers or bathtubs, coffee makers, iron/ironing board, safety deposit box and nightly turn-down service. Deluxe Ocean Verandah Suite – Our Deluxe Ocean Verandah Suites are ideally located near the Lobby in Blocks G, D and E. The suites feature a generous master bedroom, and private furnished balcony with a partial view of the ocean. One Bedroom Ocean Suite – Located on Blocks D, E, F and G near the resort’s natural mineral spring pool and lobby terrace pool, our spacious One Bedroom Ocean Suites offer beautiful views of the Caribbean from large private balconies. A separate sitting area is ideal for morning coffee and conversation. Deluxe Ocean Suite – Featuring partial views of the sea, our spacious Deluxe Ocean Suites have French doors leading to an enclosed covered sitting area. These rooms are located on Block C in close proximity to the Palazzina Restaurant. One Bedroom Beachfront Suite – Our most popular accommodation, these large One Bedroom Beachfront Suites overlooking the resort’s beautifully manicured lawn and beach are ideally located near Bella Vista Restaurant and adjacent to the main pool and swim-up bar. Features include a generous master bedroom, separate living room, walk-in shower, and private furnished balcony overlooking the turquoise ocean. Penthouse Suite – Among our most exclusive accommodations, the Penthouse Suites exude the atmosphere of a small apartment with private balconies, separate living rooms and master bedrooms. Featuring magical views of the Caribbean Sea from large private balconies, these top-floor suites are located on the top of a hill overlooking the ocean. Each is named for a celebrity guest who has visited Couples San Souci. Prime Ministers Penthouse Suite – Boasting more than 1,200 square feet of living space including a large furnished verandah with stunning Caribbean Sea views, the spacious one-bedroom Prime Minister’s Penthouse Suite is the essence of style and sophistication. In addition to its standard amenities, this elegantly furnished suite features a powder room, spacious walk-in shower and Jacuzzi for two. Hibiscus Cottage – Nestled on a cliff behind a hedge of colorful bougainvillea overlooking the Caribbean, the ultra-private Hibiscus Cottage is the ultimate secluded hideaway. This tranquil cottage features French doors leading to a private furnished balcony with breathtaking ocean views, a beautifully decorated extended living room, private infinity-edge plunge pool, large master bedroom and bathroom with walk-in shower and a Jacuzzi tub for two. Palazzina – Breakfast/Lunch/Dinner – Enjoy bistro fare from around the world in an elegant indoor dining room on the terrace. Open for breakfast, lunch and dinner with table service. Beach Grill & Bella Vista – Lunch/Dinner – For casual dining on the beach, enjoy grilled fare and fresh salads for lunch at our Beach Grill and authentic Jamaica specialties for a delectable dinner at Bella Vista. Casanova – Dinner – In a style of understated colonial elegance, Casanova’s menu features an eclectic mix of international cuisine, Caribbean ingredients for elegant dining indoors or out. Veggie Bar – Lunch – Delight with our fresh juice of the day, fruit smoothies, veggie dips and delectable healthy salads and sandwiches. In-Suite Dining – Breakfast/Lunch/Dinner – Tired after a long day exploring Ocho Rios? Just want breakfast in bed? From fresh fruit plates to pan-fried snapper, in-suite dining is our pleasure. Health & Wellness – Wellness awaits at Couples Sans Souci. From our award-winning Spa to fitness classes, staying fit has never been so fun. Four Swimming Pools – Enjoy a dip in one of our swimming pools. Surrounded by palm trees and chaise lounges, our pools overlook the Caribbean Sea and beautiful white sand beach. Swim up to the bar at the Main Pool or Sunset Beach and enjoy a cool cocktail. Three Jacuzzis – Three Jacuzzis, including one tucked just a few feet from the Main Pool, invite couples to relax and rejuvenate in a sun-splashed setting. Mineral Grotto – Full of silky mineral waters once thought to have healing powers, this pool sits behind a natural grotto that was once home to Charlie, an ancient sea turtle. Mineral Spring Pool – Soothe away every stress in our beautiful natural mineral spring pool, which is filled with water from one of the resort’s several natural mineral springs. Secluded by the spa area overlooking the ocean, this is hydotherapy at its best. Scuba diving – Dive into a world of wonder with our exceptional scuba diving program. Whether you’re an experienced diver or just starting out, you’ll delight in day and night dives. Snorkeling Tours – Take a ride aboard our glass bottom boats for a snorkeling tour to one of 30 different snorkel sites showcasing the island’s natural coral reefs. Fins, masks and snorkels are all provided. Hobie Cat Sailing – Set sail for an Ocho Rios adventure when you take one of our Hobie Cat sailboats. Never sailed before? Sign up for a beginner lesson offered by our Water sports Staff. Kayaking – Our fleet of sea kayaks offers optimum speed and grace. Available as a single or two-person hull, each kayak has a closed-deck design with self-draining scuppers to keep you dry and comfortable out on the water. Lessons and equipment available daily. Water Skiing – Our high-powered water ski boats ride smoothly over the waves, pulling guests behind them on two skis, a mono ski or a wake board. Expert instruction available. Water skis, wake boards and life vests are included. Windsurfing – The steady Caribbean breeze creates the perfect conditions for exhilarating windsurfing. Our state-of-the-art fiberglass windsurfers are perfectly sized so everyone can enjoy the experience. Equipment, life vests and lessons (9 am – 4 pm) offered daily. Hydro Bikes – Pedal your way across the seas on one of the resort’s hydro bikes. Enjoy a great bike workout while enjoying the sun and scenery. Pool Volleyball – Head to the main pool for a casual or competitive game of pool volleyball. Create a team with a few of your favorite couples or check with the Entertainment Desk for times and teams. Paddleboards – Try this offshoot of surfing in our calm Caribbean waters. If you’re a beginner, start by kneeling on the board and using your arms to propel yourself forward, then graduate to standing and using a paddle to navigate. Dance Classes -From salsa to soca to reggae, guests move to the rhythm and dance to the beat during our lively dance classes held throughout the resort. Unleash your inner islander with true Jamaican music! Beach Volleyball -Gather a few of your favorite couples for a competitive beach volleyball game on the main beach. Ask the Entertainment Team for times of play. Hat Making Classes – Sharpen your weaving skills and create a straw hat to block the sun and serve as a keepsake souvenir of your stay. Gather on the main beach at 11:30 am on Tuesdays and Saturdays for this fun, laid-back activity. Wood Carving Classes -Relive those high school woodshop classes in our wood carving class. Enjoy scarping and soothing small pieces of wood to create a memorable work to take home. Gather on the main beach on Tuesdays at 3:00pm. Piano Sing-Alongs -Join our pianist in our piano sing-a-longs every Sunday, Monday, Wednesday and Thursday at 11 pm at the Balloon Bar. Private Au Nautrel Beach Sunbathing -Couples Sans Souci is known for its exceptional au naturel facilities. Complete with a swim-up pool bar and grill, and jacuzzi, this Sunset Beach is situated on a picturesque crescent beach for the ultimate in camera-free relaxation and privacy. At Couples Resorts, all-inclusive extends to exploring! From glass bottom tours to treks at Dunn’s River Falls, you’ll find these excursions are free, too! Glass Bottom Boat Tour -Quintessentially Caribbean, a ride aboard our glass bottom boats opens up a whole new world. Explore the natural beauty of the tropics from the turquoise sea — each glass bottom boat tour is a thrilling adventure unto its own. Trip to Margaritaville -Founded by singer Jimmy Buffett, Margaritaville Ocho Rios captures the relaxed and friendly spirit of the Caribbean. Enjoy open-air dining, beach activities and island entertainment. Transportation via the Margaritaville Party Bus and entrance fee are complimentary. Dunn’s River Falls -One of Jamaica’s national treasures, Dunn’s River Falls is located near Ocho Rios. This complimentary off-property tour is well worth making the time to climb these spectacular natural waterfalls. Reserve at least 24 hours in advance at the Tour Desk. Shopping tour -Explore island artistry with a visit to a local craft market where you’ll find tie-dye, woodcarvings and block printed fabrics crafted by Jamaicans. Included in the tour is a stop at several duty free shops featuring an array of spirits, perfumes and luxury goods. Unlimited Golf -Tee off at Upton Golf & Country Club, one of Jamaica’s premier championship golf courses. Our bus picks you up at 8am and returns to the resort at 1pm. Greens fees and transportation are our treat. Private golf lessons with an experienced pro are available for an additional fee. We recommend that guests make a reservation for either course one day in advance. Please note: Caddies are mandatory and tipping is customary. Transform your honeymoon room with: Candles, rose petals and a bottle of sparkling wine for two. Set a magical stage for romance with: Tropical flowers and sparkling wine in your room upon arrival. – A sensual spa treatment with a $100 spa certificate. -$25 gift shop certificate for any last minute trinkets. We welcome you to your wedding week with: A tropical arrangement of fresh flowers and sparkling wine in your room. -A private candle-lit dinner under the stars, served by your own personal waiter. -$100 spa certificate -$50 gift shop certificate for any last minute trinkets. The memories begin the moment you walk into your room to find: A stunning tropical flower arrangement and sparkling wine for two.- A 25 minute couples’ massage plus choice of additional treatment with $100 spa certificate. -A private candle-lit dinner under the stars, served by your own personal waiter. -A $50 gift shop certificate. Indulge in whimsical romance with: A fruit carving that asks ‘Will you Marry Me?’ – A private candle-lit dinner under the stars, served by your own personal waiter. – ‘His & Hers’ manicure and pedicure, and any other award-winning treatment with $75 Spa Certificate. – Two beachfront engagement photos (5×7) taken by a professional photographer. Shower your partner with love: A stunning tropical flower arrangement, sparkling wine, and a delectable chocolate plate waiting in your room upon arrival. – A private candle-lit dinner under the stars, served by your own personal waiter. – A sensual spa treatment with a $100 spa certificate. – A $75 gift shop certificate. – A $100 certificate towards your return trip to Couples Resorts. Say “I Do” all over again with this affordable package featuring a renewal of vows ceremony for the bride, groom and four guests. 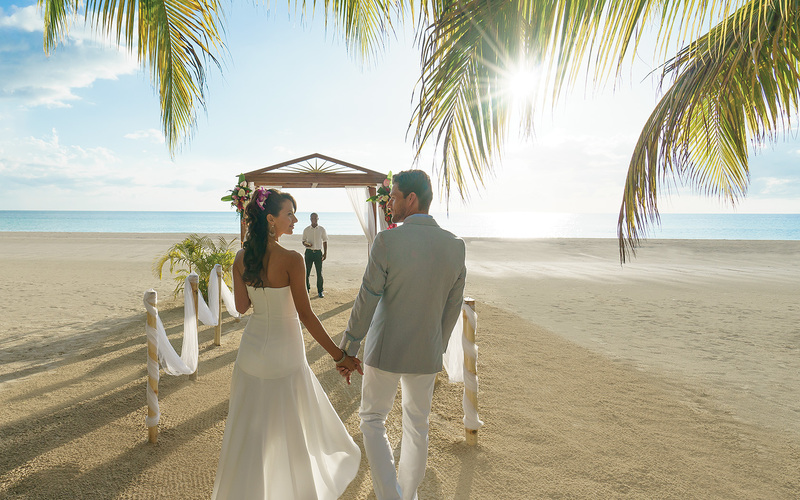 Choose a beautiful tropical garden setting or a beach side celebration at any of our four oceanfront resorts. For a limited time, you can add a private dinner for two on the beach and a 25-minute couples massage for just $99. This package requires a minimum stay of three nights.